Before we go anywhere, let’s make one thing very clear about Final Fantasy Type-0 HD. If you can’t stomach anime teens in opulent school uniforms undertaking black ops missions in the middle of a war between countries controlled by sentient crystals, then turn back now. Of course, that could be exactly what you’re looking for. 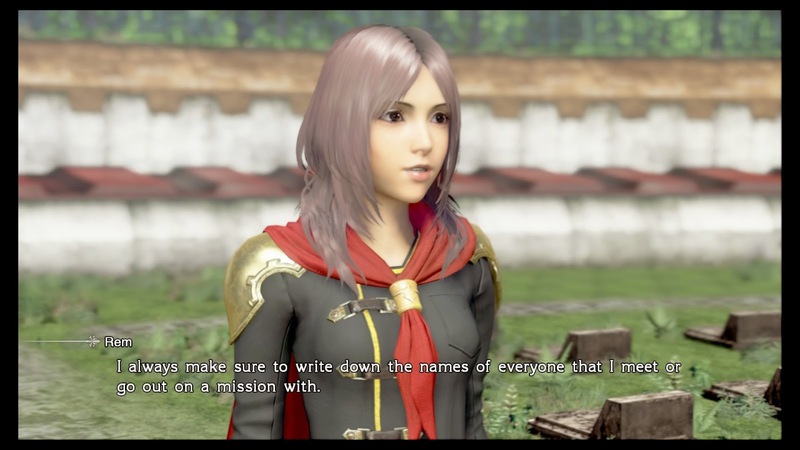 As you’ll quickly discover, Type-0 goes to a lot of places and I’ll make no guarantee that it does so coherently, to soften the blow of backstory, let’s first discuss the playable cast; Class Zero. The twelve original members of Class Zero, all named after playing cards, were from what I could discern, bred for war by one enterprising scientist Dr Arecia. As war engulfs Rubrum, one of the four crystal states, Class Zero, whose power is beyond that of regular cadets, is called upon to undertake vital and secretive missions, often behind enemy lines. After the bloody opening salvo of the war, two additional students are assigned to Class Zero; Rem and Machina, two cadets whose pasts and futures are intimately intertwined. Now anime college kids riding chocobos and casting magic sounds like a whale of a time, but Type-0 has a dark heart. You catch a glimpse of this sombre undercurrent right way, in the games excellent introduction, which sees a cadet and his chocobo gunned down by the implacable invaders of the Militesi Empire. Type-0 doesn’t ram a gritty war story down your throat; in fact it’s quite easy to forget all about it for large stretches of the game. Meaning that, when it chooses to make its presence known, it is all the more impactful. 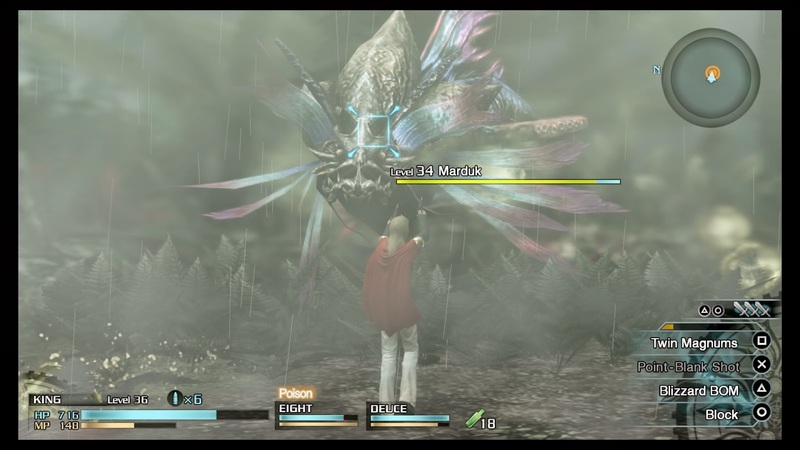 Final Fantasy Type-0 is part of Square Enix’s current Final Fantasy series; Fabula Nova Crystallis. Thus, it surprised me little to discover the L’cies, with their Focus’ granted by the Crystals, were at it once again – I still don’t know what a ‘peristylium’ is, but I think it is related. I came in with a little knowledge and familiarity, picked up playing Final Fantasy XIII and even with that, most of it still washed over me. Once I accepted that the grander movements of Type-0 were beyond my understanding, I cast my attention to the smaller stories. These tales, whether personal or political, are more grounded and ultimately far more interesting to me, for example; exploring the motivations of Rubrum’s enemies, or the awkward romance of Rem and Machina. Not truly understanding the more fantastical elements of the story isn’t as limiting as it may sound. Being unable to discern what was happening, or why, made the whole experience a little exotic and consistently surprising. Between missions, when you’re not roaming the overworld slaying monsters, you can roll around the gaudy halls of Akademeia, the college, and chat with anyone marked with an exclamation point. Some people will offer jobs, requests, but many just want to talk to the members of the renowned Class Zero. These conversations can add a considerable amount of detail and texture to the world and its citizens, some encounters are character specific. Through these conversations I learnt about the suicide squads; those that summon Eidolons (hugely powerful monsters) die as a result. If this doesn’t faze you, you may have forgotten they are cadets, teenagers going to college. 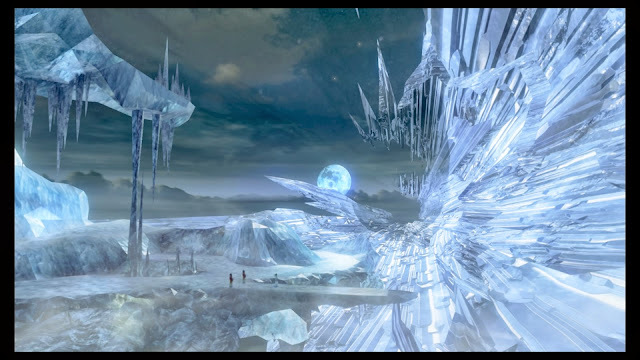 Aspects of the Crystal’s rule, like the Eidolons, are some of the world’s darker elements. For example; one such condition is that the dead are completely erased from the memories of the living, in order to keep moral high. People forget their friends, family, all of the memories they had with them, the names of the fallen are preserved only through Knowing Tags (dog tags). On the other side of the emotional spectrum; I met a creepy professor who lured my character, King, into his secret lab, sedated him, and then ‘took samples’. And a curvaceous and lower-resolution woman who seemed determined to take her clothes off, but was worried Ace (the blonde poster-boy protagonist) wouldn’t be able to handle it. The combat system, which is fully real time, was almost good enough to make me not loath the hours of grinding between story missions. Almost. Each character wields a unique weapon and move set, each with a quite different application in combat, though all can wield some amount of the same elemental magic. Therefore, it is advisable to keep the entire party of fourteen levelled sufficiently – hence the grind. You learn quickly that hammering the basic attacks will only get you so far, and the game throws enough new enemies your way, with their own weaknesses and twists, that you keep learning throughout. Rather than lashing out with the basic attacks, the smarter and often essential tact is to wait for an opening, a critical strike or killsight marker to appear, and then dart in for a devastating blow. While the game itself doesn’t hold up to the comparison particularly well, the emphasis precise timing; dodging and patience really reminded me of Bayonnetta. Final Fantasy Type-0 HD is not the master piece of character action that Bayonetta and Bayonetta 2 are, but it does have some impressive boss fights. Not all of which you are expected to win, which is both awesome and infuriating. Encountering a boss enemy and subsequently being destroyed by it, or urged to run away, is a fantastic way of making it seem menacing and lethal in a way so few bosses do. The problem is it can be supremely frustrating to fail a long fight just because you missed the dialog, often just text, telling you to run away. 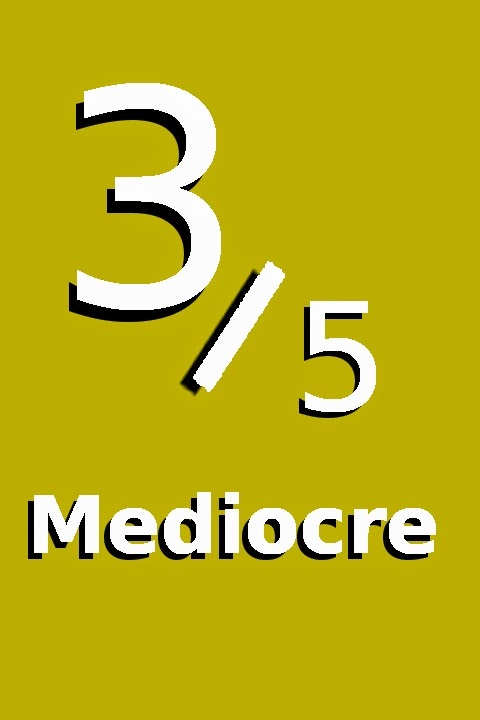 Furthermore, the characters’ strengths and weaknesses are so drastic; it is perilously easy to select the wrong squad (of three characters) and lose multiple members because they were unable to land effective hits. With fourteen characters you have some leeway, but you can’t swap them out at will, only when one falls can you select the replacement. The character selection prior to missions demonstrates some of the worst interfaces in the game, which says a lot because none of it is particularly good. Type-0s origins, as a PlayStation Portable (PSP) title is immediately apparent. The limitations of the PSP ooze their way out of just about every crack imaginable, and we’re not just talking graphically. Loading screens are legion, each individual area, many are just a dozen meters in length, requires a load and while they are fast, they remain tiresome. On the limited hardware of the PSP, partitioning the environments this way was necessary I’m sure, and it is perhaps too much to expect this re-release to address such fundamental choices. Regardless it is still an issue. Dialog, of which there is a lot, being an RPG and all, feels hacked together. Each conversation is a string of static camera shots, featuring two, or at most three, character models pantomiming at one another. They look stilted and disjointed, there are a few pre-rendered cutscenes that look smoother, but running at a higher resolution than they likely were on the PSP, they now look worse than the remodelled characters. The exchanges are not helped by the dialog itself, which makes sense, but is by no means natural English. Type-0 HD does offer both English and Japanese voice acting, I chose to play predominantly in English in a futile attempt to better understand the narrative, nevertheless it is nice to be given the option. The quality of the English voice acting ranges from comical to acceptable, but never anything better, the characters voices and personalities did stick in my mind though, which is no mean feat considering you control a party of fourteen characters. The one and only area in which Type-0 HD is technically impressive is the models and animations of the fourteen protagonists. With the unique move sets come unique animations, including cloth, skirts specifically – I rolled my eyes too. Seven for example, wears bicycle shorts, allowing her skirt to be airborne more frequently, or at least more blatantly. Sadly, catching glimpses of the guys’ backs, when their cloaks flap, doesn’t quite feel the same. Final Fantasy Type-0 has a style and tone that I found really appealing, while I couldn’t always explain what was happening, I always wanted to see what was coming next. Type-0’s best feature is undoubtedly it’s fast-paced and rewarding combat system, yet even that is not enough. Type-0 remains caught in the unyielding gravity of its PSP roots. Simply knowing where the problems originate does not excuse them, and the half-baked improvements to the visuals only compound its problems further. 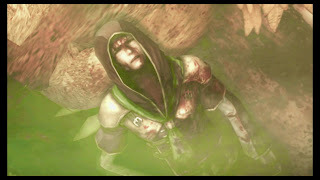 There are elements of brilliance in Type-0 that leave me yearning to delve into the series in the future, something previous titles have failed to do, but its flaws are immediate and many.